We drove up the long snow covered road into the forest and arrived at some little wooden buildings and a tee-pee. We were greeted by the host and hostess of Ollila, Tuomo and his wife Marjo. Tuomo explained what he had in store for us that day and the dinner that Marjo planned to cook us and then we set off. 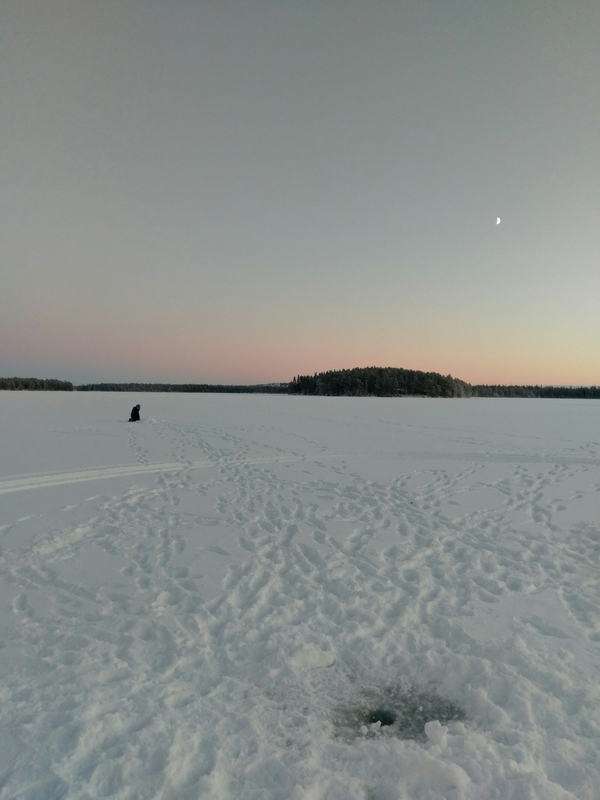 We climbed aboard a snowmobile and sleigh and drove to a huge snow and ice covered lake surrounded by forest. 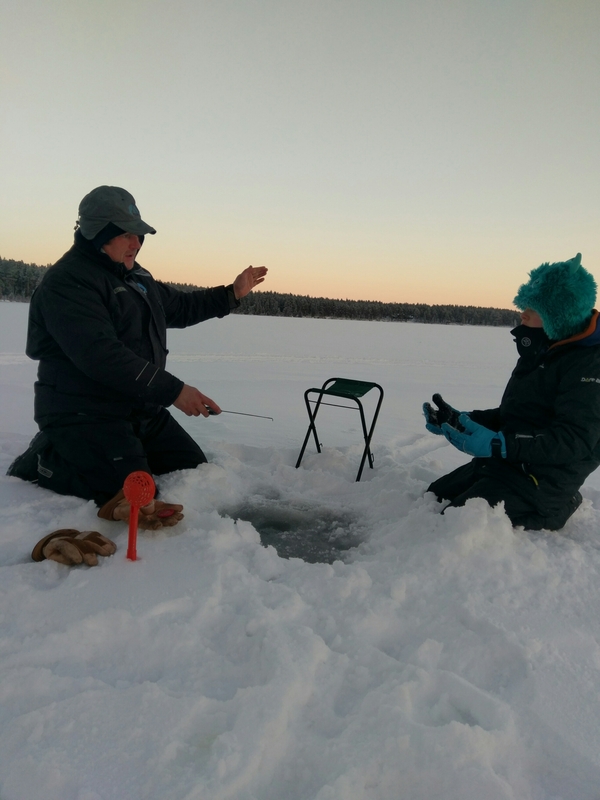 Here we were shown how to net fish under ice. Tuomo was brilliant with the children and very patiently showed them how its done, giving us all a chance to have a go. He told us all about his families history of fishing and the older and more modern ways of doing it. We helped to pull up the nets and found some fish which would later be our dinner! 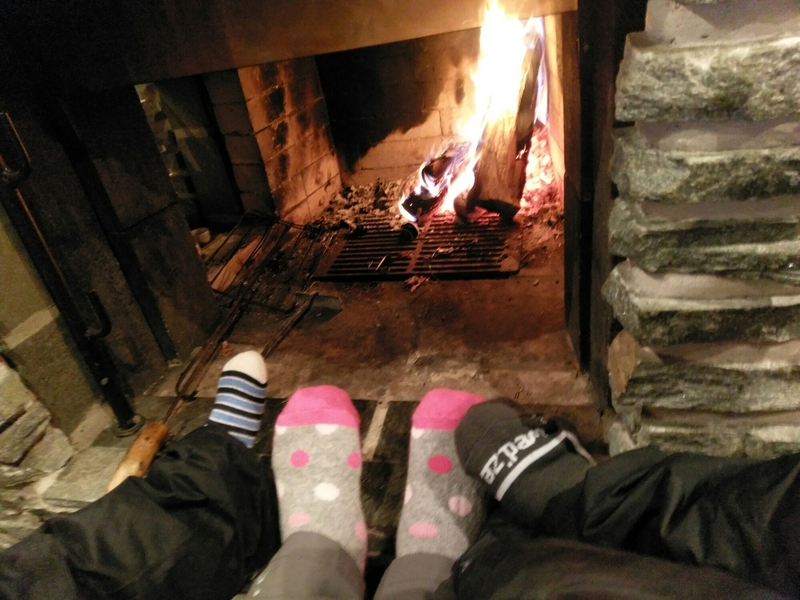 After this we headed back to the Juomuskota fireplace to warm up by the fire with hot drinks and biscuits. 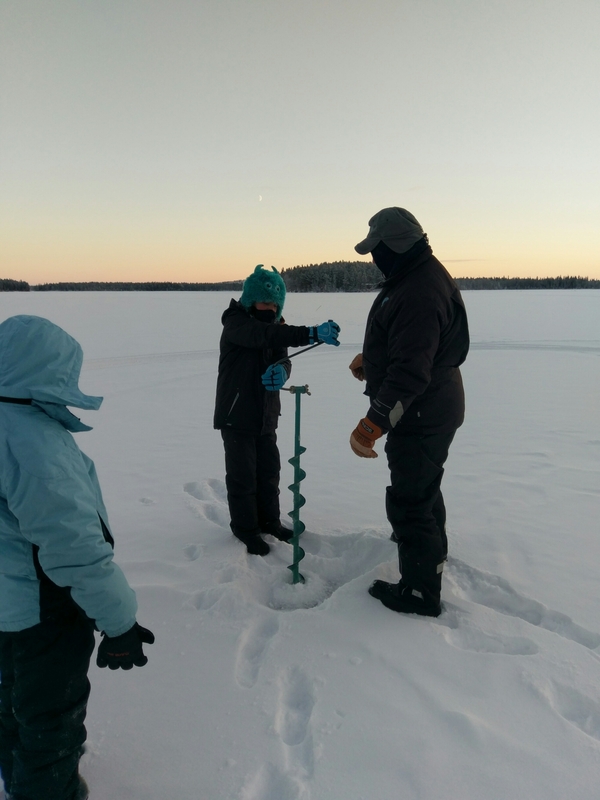 We then set out again on the snowmobile to a different part of the lake and learnt how to drill our own holes in the ice to fish with rods. The youngest surprised us all by catching a fish by himself! After the fishing trip we returned to Juomuskota, the 11 year old getting to have a go at driving the snowmobile which he was thrilled with. We were served a lovely meal made of all the fish we caught that day and a delicious berry cake for dessert. We had such a lovely and interesting time at Ollila and were really made to feel at home. All the kids loved the experience and were kept occupied for the whole day. 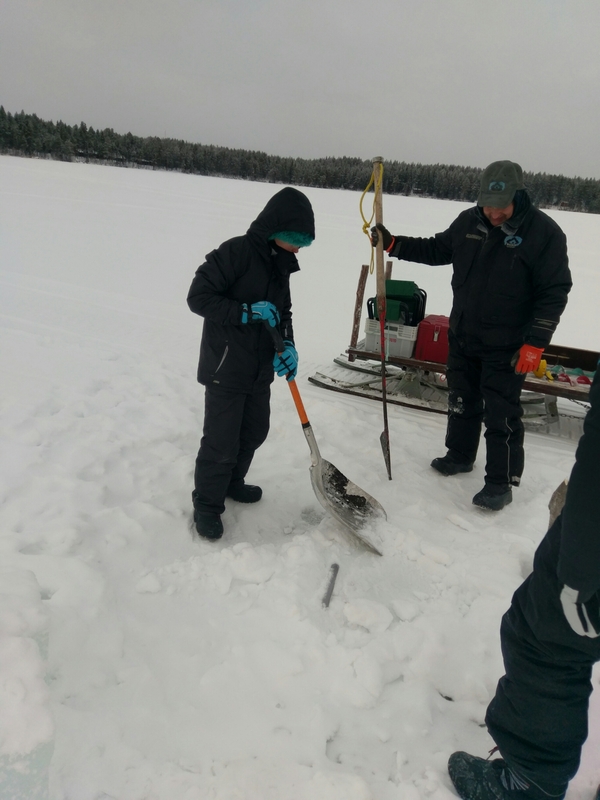 Winter fishing with an autistic child? At Ollila with an older child, definitely! The host was extremely patient and interesting and brilliant with the children. There was space to wander off a little on his own, if needed, to play in the snow and the day was private and peaceful. The option to go inside to warm up and have a break was always available to us. The price for the day was €60 per adult and €30 for under 12’s. This included all food and drink. Ollila is near to Kuusamo in Northern Finland. Other trips are available both in Summer and Winter and there is also accomodation on site. The website is www.ollilanlomamajat.fi and the contact email is info@ollilanlomamajat.fi You will get a reply if you email, although not straight away as Tuomo may be out on trips. The host speaks very good English. Previous Post 10 great tips for flying with an autistic child! Wow that’s some snow. Looks like you had a fab time. That looks like an adventure. I would be so afraid that I would fall into that fishing hole. Was the fish frozen? I have not experienced this kind of winter activity. Maybe my sons would love to do this because they are all for adventure. That would be a great experience for all ages. And good to know that the hosts are accommodating and pleasant to the kids too. 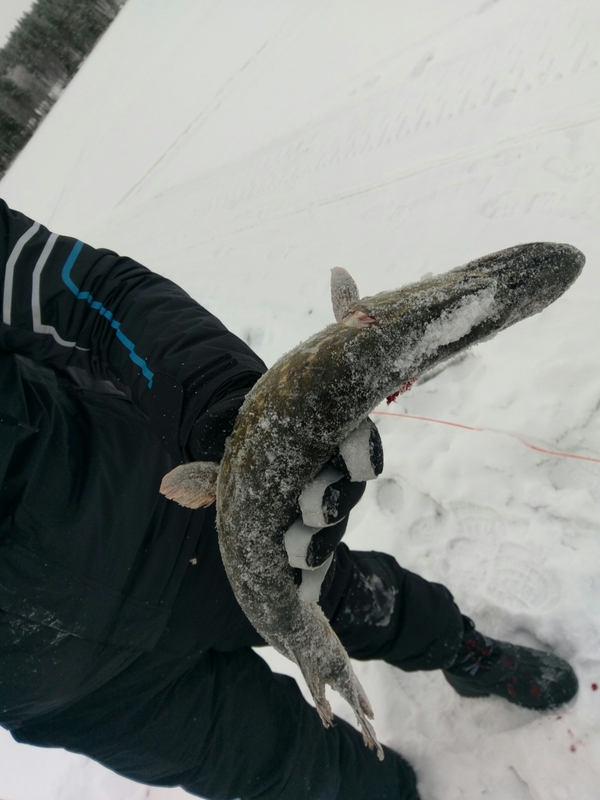 I hope me and my family could have that time with the snow and fishing too. I had the impression that you could just cut out a block of ice and find fish in it. I’m just curious, are the fish frozen when you get them out? 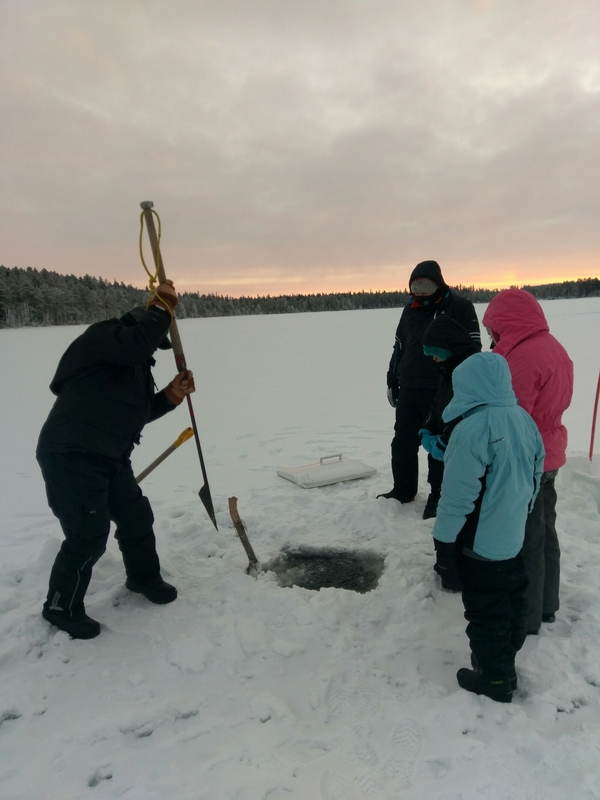 The ice is pretty thick, to cut the hole we needed a drill! Nope the fish were swimming around. They must not mind the cold! Hahaha. Oh well, thanks for the info. I watched too much cartoons as a kid. Talk about frozen fresh! Looks like an amazing experience. 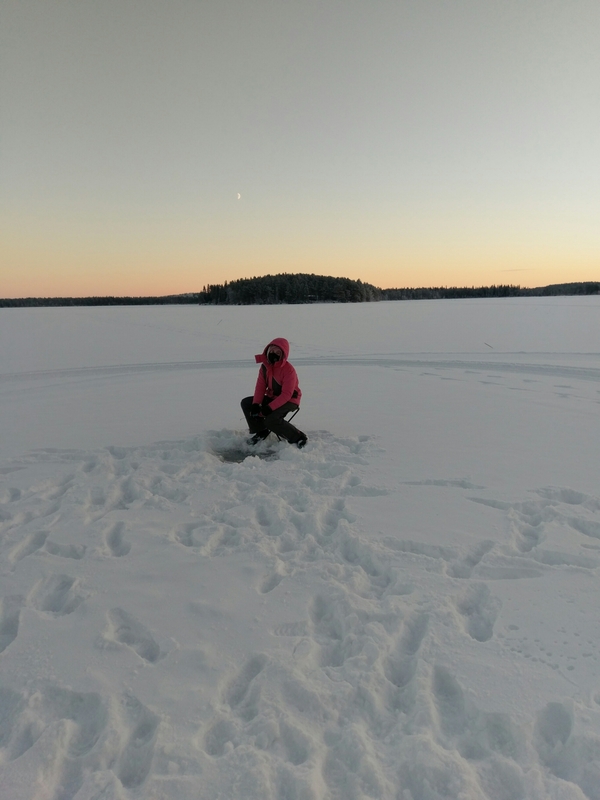 I have always wanted to try ice fishing, but I do not do well with the cold. 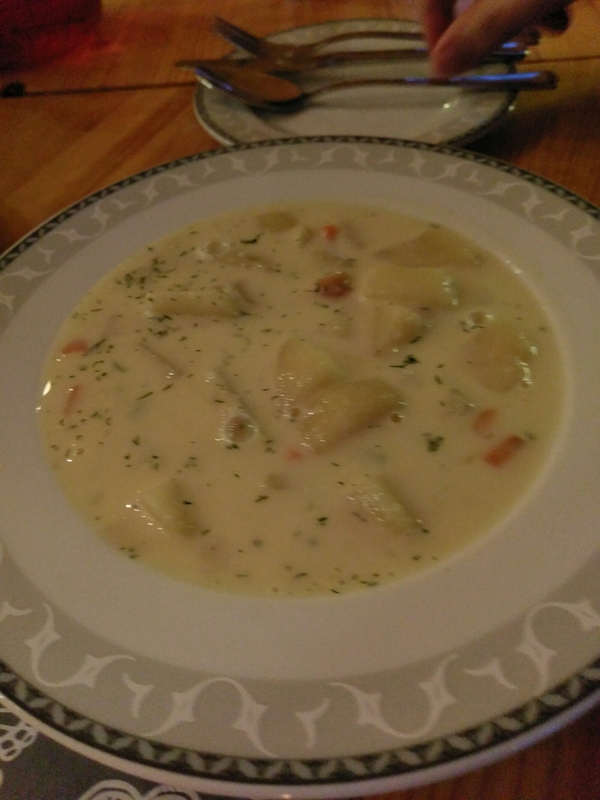 Although I can see myself cozing up to the fire with a delicious chowder. As fun and exciting as this looks, you guys are super brave and did a brilliant job. I’m so happy to hear that you had a wonderful time in this place in Finland. I was so amzed when i first read the tittl and saw these pics from my home country. This would be a one perfect adventure. I love to experience snow something I haven’t done. Fishing is exciting. And combining this together is awesome! 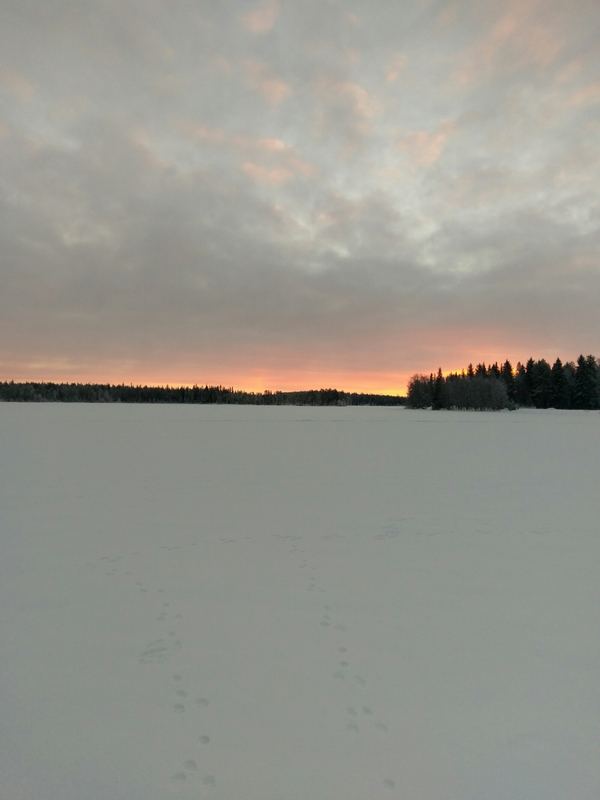 Ollila seems to be a beautiful place to visit! Catching all the fishes alone by himself would have been a great accomplishment for the child! These small things contribute to making a positive personality to children! A great adventure to go through.